Eye On Tampa Bay: The St. Pete Pier Committee ranking of proposals, eight hours in the weeds and 3 hours ranking to no decision. The St. Pete Pier Committee ranking of proposals, eight hours in the weeds and 3 hours ranking to no decision. Imagine being invited over to a friends house to view a paint drying. Included in the invitation is the promise of $500 bottle of Dom Perignon if you stay and evaluate all of the colors. Not bad you say I’m in. You show up at your friend’s house and are shown into the paint chamber along with some friends. A painter enters and quickly paints the room. The paint begins to dry the group makes a few comments then suddenly the door opens and another painter comes in and begins to paint the room again. What the invitation did not say was there are 6 different colors of paint and something like 16 shades of each color. This is obviously going to be a long evening. Would you stay to get your bottle of Dom? Such was the situation at the Friday St. Pete Pier Selection Committee meeting. The level of detail in the submission review was almost excruciating. After months of presentations, videos and a public survey, it was not clear why the detail review was necessary. Following the discussion was confusing at times. It was easy to get lost in the weeds. After eight hours of discussion the group eliminated three proposals leaving four. Since the objective was to get to three and rank them you would have thought the committee would simply eliminate one, rank the remaining three and call it a day. There was a motion to shortlist the remaining four, that when you think about it, made no sense at all. It passed after some public comment including suggestion that the Committee stop right there and hold another meeting with input from the finalists to answer some of the questions that had been raised. 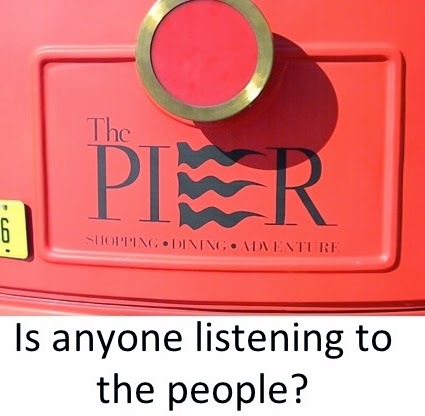 As it appeared that Destination Pier was about to be ranked third, several from the audience began to cry foul since destination Pier had been the highest ranked in the public survey. In the end Ed Montinari, long involved in in the Pier process and a frequent voice of reason, suggested the committee stop and reconvene. They folded with no decision after almost 11 hours of discussion.